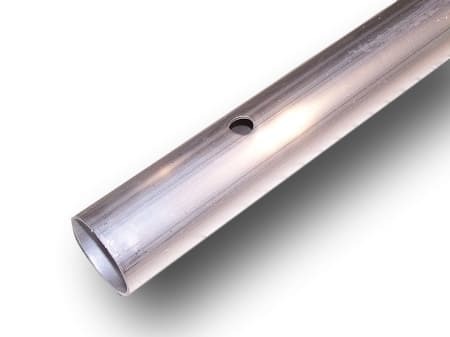 Alumi-Span has a variety of 2.00” outside diameter posts in both aluminum and galvanized steel. 8' post (only) are shipped cut at 95" to conform to UPS regulations. We recommend most customers buy aluminum because it is better looking, lightweight and never rusts. Anything over 95" long can involve high shipping costs, but Alumi-Span solves that problem by using special 2-piece posts in 10’, 12' lengths in aluminum. They are easily assembled, and very strong. Another handy product is our post extension. They are 18” long and will fit neatly into the top of a standard 2” post to make it higher for putting on torpedo bumpers or other applications where you don’t want to take the dock apart just to raise a post. For some structural applications like long cross-arms, or very long posts you may want to consider our 2" galvanized steel as an alternative.